i had to write a haiku for an ice breaker game the other day. i'm terrible at writing, but funny how i blog, huh? anyways, my haiku was not great, but it was an interesting ice breaker because it made me think and be creative. we were paired up and had to introduce ourselves to our partner. then, we had to write a haiku about our partner and introduce him/her to other people in the room with our haikus! it was fun, but it still didn't improve my poetry-writing skills. i'm sure you've seen the craze over these cookies over instagram if you've been following food bloggers. these salted chocolate chunk shortbread cookies were so, so, so good, and i normally am not a fan of shortbread cookies. but it's the flavor combo that does the trick- the shortbread cookie texture with the dark chocolate, the hint of salt, the buttery-ness, and the crunch from the raw sugar coating around the edges. it's quite delightful. it'll take a little longer than a normal chocolate chip cookie, but at this point, i'm throwing these in a different category, like "you're kinda fancy so i will make you kinda fancy cookies, too." because that basically means you are worth the extra time it took for me to make these cookies, amirite? baker's notes: this recipe calls for salted butter, but if you don't have that, unsalted is also fine- just also add 3/4 teaspoon to the mix, as noted in the recipe below. using a large serrated knife is easiest to slice these cookies, but if you're like me and don't own a full knife set, a jagged steak knife will work-ish, if you slice slowly and carefully. also, the recipe calls for an egg. please note this: do not add the egg to the cookie dough. it's reserved for brushing the log of dough to get the turbinado sugar to stick. again, do not add the egg to the cookie dough. in a large bowl, beat together the butter, (salt, if using unsalted butter), granulated sugar, brown sugar, and vanilla until light and fluffy. Stir in the flour and mix until just combined. Add chocolate chunks, and mix until just incorporated. don't worry- the mixture will look crumbly. divide the dough between two sheets of parchment paper, waxed paper, or plastic wrap, and using your hands, form each half into log shapes about 2-inches to 2 1/4-inches in diameter. A larger diameter means a larger cookie, so do whatever you please (but adjust the baking times later if you do this). wrap the parchment paper, waxed paper, or plastic wrap around the logs, and chill until completely firm, about two hours. If you're in a rush, try sticking them in the freezer for about 30 minutes. when the dough is chilled and ready to go, preheat the oven to 350 f. prepare one or two large baking sheets with parchment paper and set aside. crack the egg into a small bowl, and lightly beat it. take your cookie dough logs, and brush the beaten egg over the sides of the log. sprinkle the turbinado sugar over open paper/plastic wrap, and roll the logs in the sugar to coat the sides. using a sharp serrated knife (see note above), cut the logs into 1/2-inch thick rounds. saw gently to keep the dough from breaking, especially when you hit the chunks of chocolate. 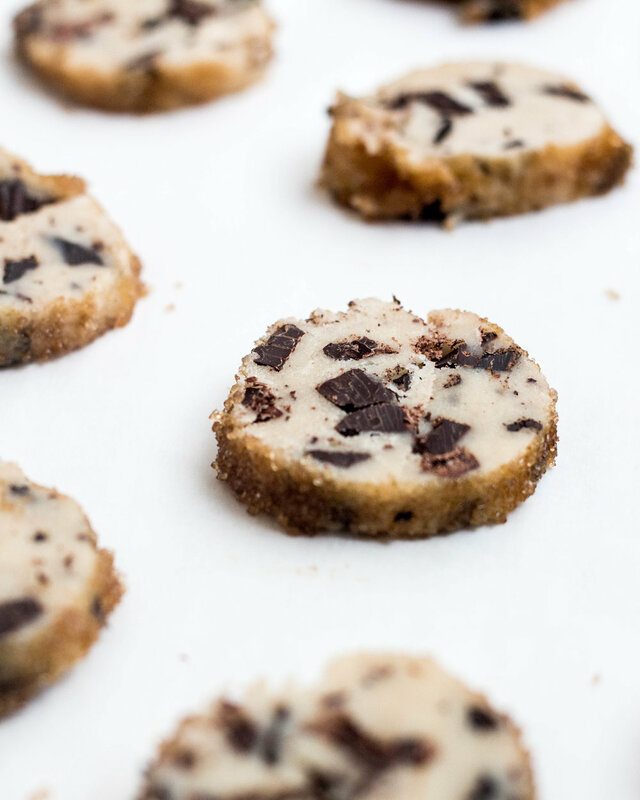 place cookie slices on prepared baking sheets, about an inch apart, as they don't spread much. sprinkle the tops of the cookie with some salt flakes, if using. bake cookies for 12 to 15 minutes, or until the edges of the cookies are slightly golden brown. let cool on cookie sheets for about 10 minutes before transferring to wire racks to cool completely.